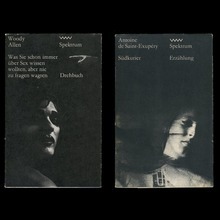 Designed by Herbert Thannhaeuser in 1955 and later reworked for phototypesetting. Digital versions include Garamond No. 4 (URW), Garamond No. 5 , Typoart Garamond (both by Elsner+Flake), and Garamond Antiqua Pro (RMU, 2015). Monotype Garamond is similar. The sample uses Garamond No. 5 .